Get a byte of Footscray's games-themed burger joint. 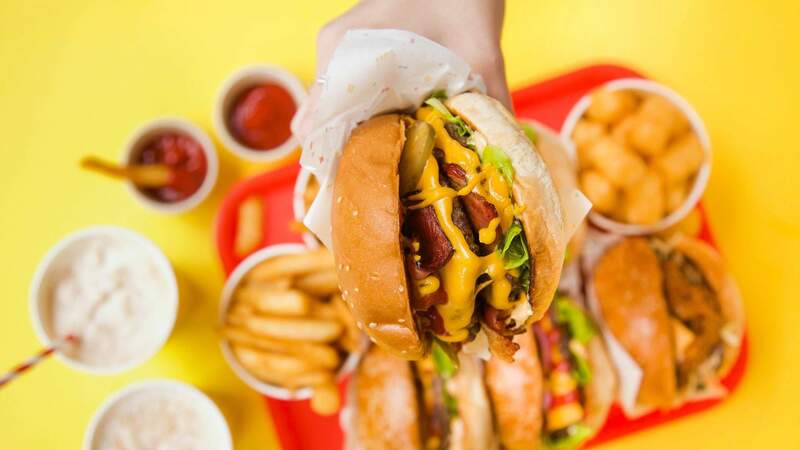 It's hard to believe there's room left in Melbourne for another burgeoning burger joint, but there's always a place for any kind of themed food venture – especially one with a digital edge. 8bit is Footscray's latest and greatest (and only) burger outlet and patties are already being downloaded by the dozen. Setting up shop on Droop Street's corner complete with Space Invader-esque burger print pasted around the entrance, it's best to seek these guys out early in the day if you want to nab a table. Or, in case the system crashes and they sell out. Inside, the colour palette and fit out are an Instagramer's dream: the open plan kitchen gives way to minimalistic white tiles that line the walls with pixels of blue, red and yellow. An arcade game stands by to occupy hungry patrons and pots sprouting your favourite gaming heroes such as Yoshi, Pac-Man and Mario act as table numbers. Plants in coloured ceramic complement the spacious wooden table settings. Select your level of difficulty and get playing. The burger buns are soft and faultless but nothing we haven't seen before; it's the hardware inside that wins this game. The 8bit with cheese ($8.50) is perfect for beginners, with all of the classic elements of a traditional cheeseburger, while the After Burner ($9.50) is for the more daring — mustard and 8bit sauce is substituted for chilli sauce, jalapenos and chipotle mayo to spice things up. Load up on golden, beer battered fries ($3-5) or add cheese and bacon with spring onions ($7) for a generous serving suitable for two players. The milkshakes ($6.50) are flavour-rich and creamy, coming in the variety of salted caramel, peanut butter, strawberry cheesecake and chocolate bar. The guys at the counter are still learning the ropes but it's good, honest service. Most importantly, though, is the delectable presentation. In an age so enthralled by appearance, 8bit has this game clocked, from the aesthetically pleasing arrangement of the food to the design of the paper packaging. It's easy to get swept up in the thrill of the theme — get a byte of this burger.